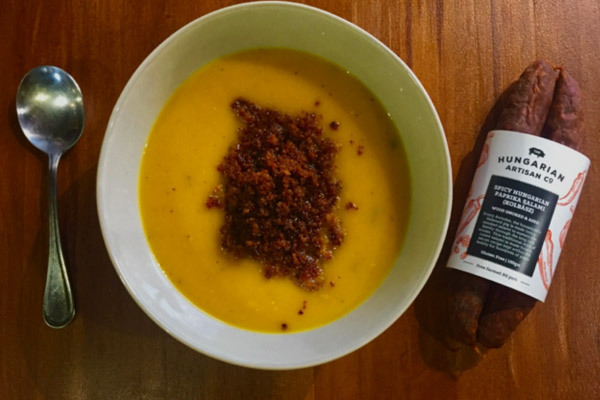 Recipes – The Hungarian Artisan Co.
Checkout our delicious recipes below. This crumb is so simple to make and adds masses of flavour to all sorts of dishes. We love to sprinkle it on top of salads, soups, (try on a cauliflower or pumpkin soup) seafood and chicken dishes. Add a roughly chopped 150g pack of The Hungarian Artisan Co. kolbàsz to a food processor along with a cup of breadcrumbs. Blitz until blended to a crumb consistency. Add the crumb to a pan on a medium to high heat with a drizzle of olive oil. After a few moments the mixture will start to sizzle. Once it has cooked through, you should have a nice crispy crumb. Take off the heat and serve sprinkled on top of your dish. Add Capers and finely chopped shallots in the last moments of frying the crumb. When finished thrown in a handful of chopped fresh parsley or dill and grated lemon zest. This goes well with white fish or salmon. Try serving with a dollop of sour cream to bring an authentic Hungarian flavour to the dish. A simple, yet hearty tomato and chickpea dish with eggs. 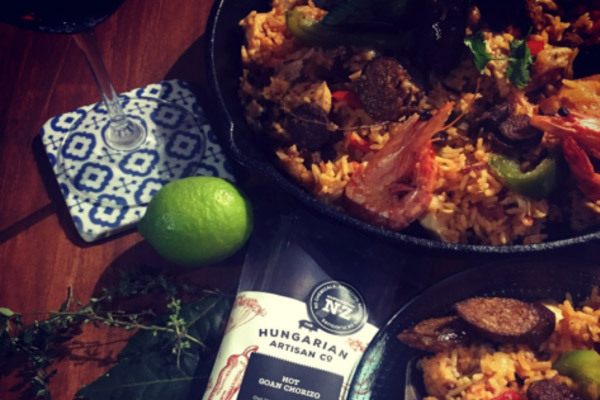 We add our Spicy Hungarian Paprika Kolbàsz flavoured with sweet Hungarian paprika, garlic and spices which gives this dish something really special. This is one of our favourite meals to make at home. It’s perfect for a lazy weekend brunch and packs plenty of flavour. It’s also filling enough to be served a main meal. Serve this with fresh crusty bread. A scattering of fresh herbs and goats cheese or feta will finish it off nicely. Gently fry the onion with a dash of olive oil, after the onion has softened add the capsicum and the Kolbàsz to the pan. After a few minutes, you’ll see the kolbàsz start to crisp up slightly and the flavours and colour will infuse the onions and capsicums, at this point add the cumin and paprika, stirring it all together before adding the chickpeas, then tomatoes. Continue to cook on a moderate heat for another few minutes. Lower the heat and make four wells within the pan, cracking an egg into each space. Cover the pan with a lid to create a little steam which will help to cook the eggs through without burning the bottom of the pan. Once your eggs are cooked to your liking, take the pan off the heat (or slightly before as they will continue to cook a little) and garnish with the fresh green herbs and the goats cheese or feta before serving with the bread to soak up the sauce. Goa meets up with New Orleans in this vibrant and spicy rice dish with prawns and Hot Goan Chorizo. Handful of fresh flat leaf parsley to scatter on top. 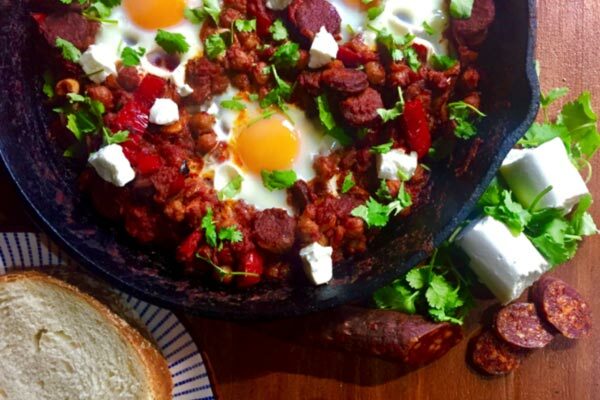 In a heavy based large pan, on a medium heat fry up the chorizo with a splash of olive oil until browned, remove the chorizo keeping to the side and add the onion and capsicum to the remaining oil. After a few moments add in the garlic, cooking for a few minutes longer adding a little more oil if needed. Add the paprika, tomatoes, then rice stirring through before adding the chicken stock, thyme and bay leaves. Cover and stir occasionally. When the rice is almost cooked add in the prawns. Once cooked add the chorizo and stir through, season with salt. Serve with lime wedges and a sprinkle of parsley. A fresh green salad is a great addition to the dish.